Metropolitan France (French: France métropolitaine or la Métropole) (also known as European France or Mainland France) is the part of France in Europe. It comprises mainland France and Corsica, as well as other islands in the Atlantic Ocean, the English Channel (French: la Manche), and the Mediterranean Sea. Overseas France (la France d'outre-mer, or l'Outre-mer, or colloquially les DOM-TOM) is the collective name for the part of France outside Europe: French overseas regions (départements et régions d'outre-mer or DROM), territories (territoires d'outre-mer or TOM), collectivities (collectivités d'outre-mer or COM), and the sui generis collectivity (collectivité sui generis) of New Caledonia. Metropolitan France and Overseas France together form the French Republic. Metropolitan France accounts for 82.0% of the land territory, 3.3% of the exclusive economic zone (EEZ), and 95.9% of the population of the French Republic. The five overseas regions (departments)— French Guiana, Martinique, Guadeloupe, Réunion, and Mayotte—have the same political status as metropolitan France's regions. Metropolitan France and these five overseas regions together are sometimes called la France entière ("the whole of France") by the French administration. But this France entière does not include the French overseas collectivities and territories that have more autonomy than do the overseas departments. The term "metropolitan France" dates from the country's colonial period (from the 16th to the 20th centuries), when France was referred to as la Métropole (literally "the Metropolis"), as distinguished from its colonies and protectorates, known as les colonies or l'Empire. Similar terms existed to describe other European colonial powers (e.g. "metropolitan Britain", "España metropolitana"). This application of the words "metropolis" and "metropolitan" came from Ancient Greek "metropolis" (from μήτηρ mētēr "mother" and πόλις pólis "city, town"), which was the name for a city-state that created colonies across the Mediterranean (e.g. Marseille was a colony of the city-state of Phocaea; therefore Phocaea was the "metropolis" of Marseille). By extension "metropolis" and "metropolitan" came to mean "motherland", a nation or country as opposed to its colonies overseas. Today, some people in overseas France object to the use of the term la France métropolitaine due to its colonial history. They prefer to call it "the European territory of France" (le territoire européen de la France), as the Treaties of the European Union do. Likewise, they oppose treating overseas France and metropolitan France as separate entities. For example, INSEE used to calculate its statistics (demography, economy, etc.) for metropolitan France only, and to analyze separate statistics for the overseas departments and territories. People in the overseas departments have opposed this separate treatment, arguing that the then four overseas departments were fully part of France. As a result, since the end of the 1990s INSEE has included the four overseas departments in its figures for France (such as total population or GDP). The fifth overseas department, Mayotte, has been included in the figures for France since the mid-2010s too. INSEE refers to metropolitan France and the five overseas departments as la France entière ("the whole of France"). "The whole of France" includes the five overseas departments, but does not include the other overseas collectivities and territories that have more autonomy than the departments. Other branches of the French administration may have different definitions of what la France entière is. For example, in contrast to INSEE, when the Ministry of the Interior releases election results, they use the term la France entière to refer to the entire French Republic, including all of overseas France, and not just the five overseas departments. Note that since INSEE now calculates statistics for la France entière, this practice has spread to international institutions. For instance, the French GDP published by the World Bank includes metropolitan France and the five overseas departments. The World Bank refers to this total as "France"; it does not use the phrase "the whole of France", as INSEE does. Metropolitan France covers a land area of 543,940 km² (210,016 sq. miles),[a] while overseas France covers a land area of 119,396 km² (46,099 sq. miles), for a total of 663,336 km² (256,115 sq. miles) in the French Republic (excluding Adélie Land in Antarctica where sovereignty is suspended since the signing of the Antarctic Treaty in 1959). Thus, metropolitan France accounts for 82.0% of the French Republic's land territory. At sea, the exclusive economic zone (EEZ) of metropolitan France covers 333,691 km2 (128,839 sq mi), while the EEZ of overseas France covers 9,825,538 km2 (3,793,661 sq mi), for a total of 10,159,229 km2 (3,922,500 sq mi) in the French Republic (excluding Adélie Land). 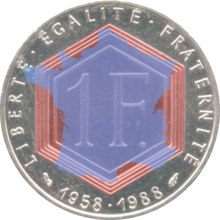 Thus, metropolitan France accounts for 3.3% of the French Republic's EEZ. According to INSEE, 65,018,000 people lived in metropolitan France as of January 2018, while 2,790,000 lived in overseas France, for a total of 67,808,000 inhabitants in the French Republic. Thus, metropolitan France accounts for 95.9% of the French Republic's population. In the second round of the 2017 French presidential election, 35,467,327 French people cast a ballot (meaning a turnout of 74.56%). 33,883,463 of these (95.53% of the total voters) cast their ballots in metropolitan France (turnout: 76.26%), 1,003,910 (2.83% of the total voters) cast their ballots in overseas France (turnout: 53.59%), and 579,954 (1.64% of the total voters) cast their ballots in foreign countries (French people living abroad; turnout: 45.84%). The French National Assembly is made up of 577 deputies, 539 of whom (93.4% of the total) are elected in metropolitan France, 27 (4.7% of the total) in overseas France, and 11 (1.9% of the total) by French citizens living in foreign countries. Mainland France (French: la France continentale), or just "the mainland" (French: le continent), does not include the French islands in the Atlantic Ocean, English Channel or Mediterranean Sea, the largest of which is Corsica. In Corsica, people from the mainland part of Metropolitan France are referred to as les continentaux. A casual synonym for the mainland part of Metropolitan France is l'Hexagone ("the Hexagon"), for its approximate shape, and the adjective hexagonal may be a casual synonym of French (usually understood as metropolitan only, except in topics related to the foreign affairs and national politics of France as a whole). ^ French Land Register data, which exclude lakes, ponds and glaciers larger than 1 km² (0.386 sq mi or 247 acres) as well as the estuaries of rivers. French National Geographic Institute data, which includes bodies of water, gives a value of 551,695 km2 (213,011 sq mi) for the land area of Metropolitan France. ^ Population of Metropolitan France: . The population of all five overseas departments totaled 2,169,000  in January 2018. The population of the overseas collectivities amounted to 621,000 inhabitants (Saint-Pierre and Miquelon , Saint-Barthélemy , Saint-Martin , French Polynesia , Wallis et Futuna , New Caledonia ). The total population of the overseas departments and territories of France is estimated at 2,790,000. ^ Minister of the Interior, Government of France. "Résultats de l'élection présidentielle 2017" (in French). Retrieved 2018-06-20.